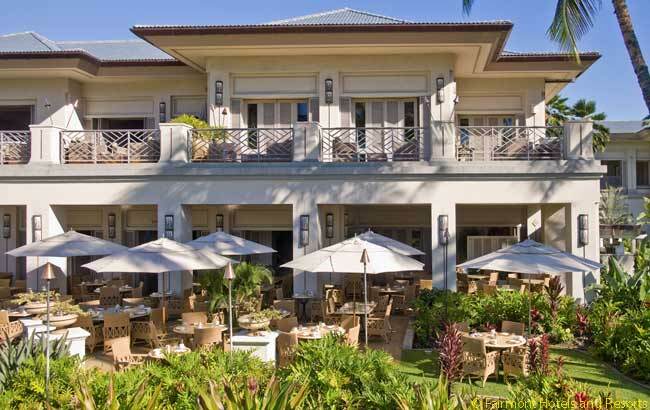 Looking out at the sweeping view on the garden side of the Fairmont Orchid hotel and resort, I let my eyes rise from lush green golf courses to the uplands. I see broad horizontal bands of mauve, ochre and green striping the hills beneath a blue Hawaiian sky. It’s my first time back on the island of Hawaii (aka The Big Island) in nearly six years, and I couldn’t be much happier. 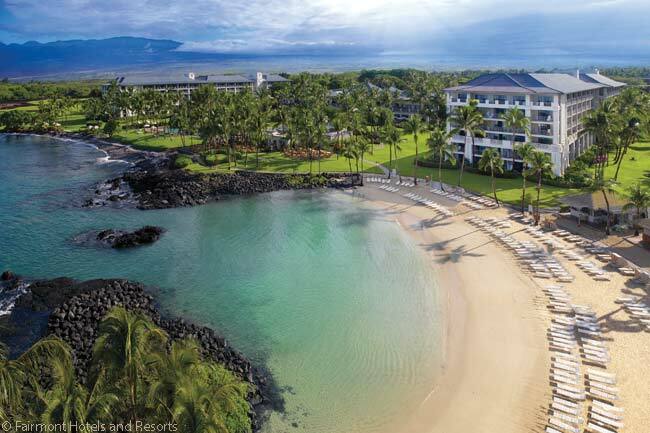 The Fairmont Orchid is housed in 1990 buildings that were renovated and refreshed in late 2012, with new guestroom decor and 32,000 square feet of revamped meeting spaces. Blossoming beside the Pacific Ocean on the Kohala Coast, in the northwest corner of the Big Island of Hawaii, the Orchid is a beautiful, comfortable base from which to explore. A resort hotel in the portfolio of Toronto’s Fairmont Hotels and Resorts, the four-diamond Orchid sits on 32 oceanfront acres edged by a white sand beach, flanked by the aforementioned golf courses and speckled with trees, a waterfall and a lap pool. 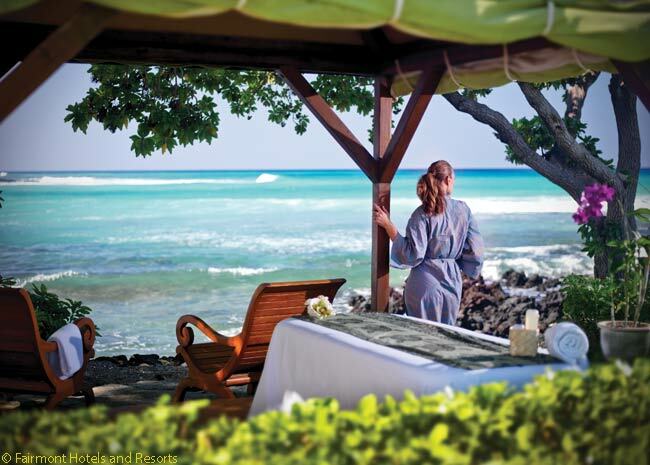 Watering holes – the kind that pour adult beverages – as well as restaurants and a deli are clustered near the beach, and the evocatively named Spa Without Walls offers massages and treatments outdoors. The place is big, with 540 guestrooms and 54 suites, but it rarely feels bureaucratic, thanks to an attentive and helpful staff. My wife Georgina and I saw the best of the best, as we were ensconced on the Fairmont Gold level on the 6th floor of the North Tower. This is almost a hotel within a hotel, complete with its own check-in desk, three free-use desktop PCs, a specialized staff and a spacious lounge. We availed ourselves most mornings with the continental breakfast buffet there. Fresh fruit, pastries and good coffee were among the highlights. One morning we ate at the ground floor Orchid Court, where a larger and more diverse menu is on offer in a space shared with perky little wild birds. This restaurant is open to all guests. Happily, the daily $22 valet parking charge or $17 daily self-park charge are subsumed into the daily Fairmont Gold rate. When I checked standard rooms on the hotel’s Web site recently, most rooms this summer start at $299 per night. 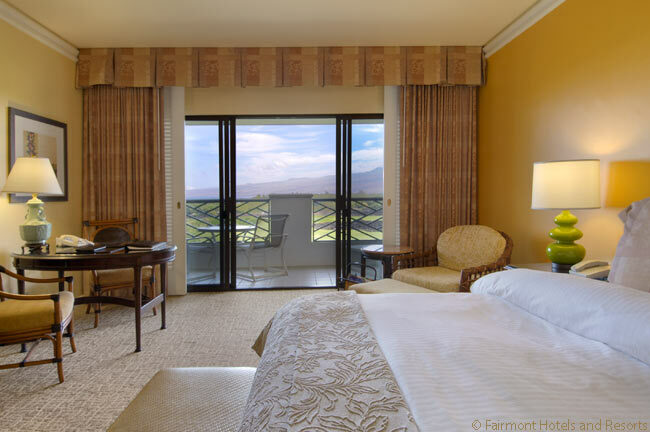 Our garden view Fairmont Gold room was listed from $499. Our room, at 522 square feet (48 square meters), was subtly restful: soft colors, fine fabrics and a firm but comfortable bed. We had a small refrigerator, an in-room safe and a 42-inch LCD flat-screen TV that we didn’t turn on. Why watch TV when you can gaze at Hawaii? On a previous visit, we had a suite on the ocean side: bigger, with more action, but also noisier. I liked the quiet and the cooling afternoon shade of the east-facing garden side on our lanai (balcony). The marbled bathroom was spacious, with his and hers wash basins, a bathtub and a walk-in shower without a door that evoked the feeling of showering out of doors. As comfortable as our room was, Hawaii is about the great outdoors. Uncharacteristically, the winds were very strong on all but the last day of our recent four-day visit. The gusting wind did, however, have the salutary effect of cleansing the Big Island of “vog” – lingering haze and smoke produced by the Kilauea Volcano, which has been erupting for several years. The Big Island, like the rest of the Hawaiian Islands, was created by volcanoes and the isle grew around a rugged mountainous interior. On previous visits, we took the 90 minute drive to Hawaii Volcanoes National Park, to see and smell – at a safe remove – all the steaming, heaving action. Our activities this time were of a gentle sort, consisting mainly of renting beach cabanas at the Orchid, wigging our toes in the sand or plopping down in a lovely seaside gazebo used for some of the hotel’s numerous wedding ceremonies, where we caught up on reading. The Orchid is also a good place to sup and sip. Norio’s Japanese Steakhouse and Sushi Bar, run by a talented young Japanese American chef, lays out a sumptuous spread. 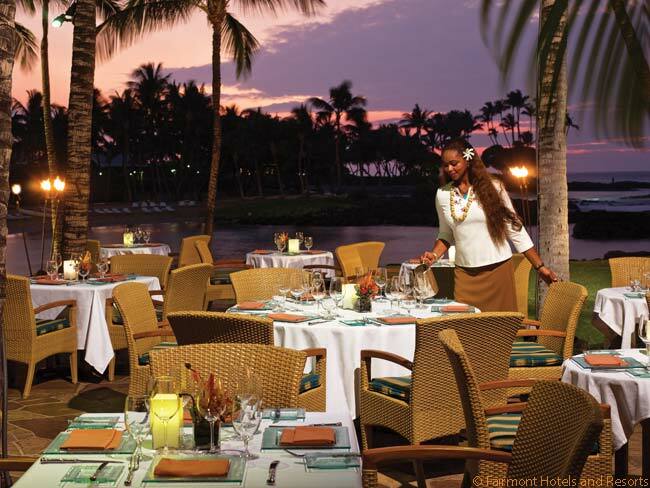 Brown’s Beach House, the resort’s best-known restaurant, showcases hula dancers and guitarists playing Hawaiian tunes and mainstream pop nightly. And with Pacific trade winds rustling the palm trees, the tropical ambience enhances the toothsome food. Brown’s changing menu is highlighted by fresh-caught ocean fish, some of it pulled from Hawaiian waters. 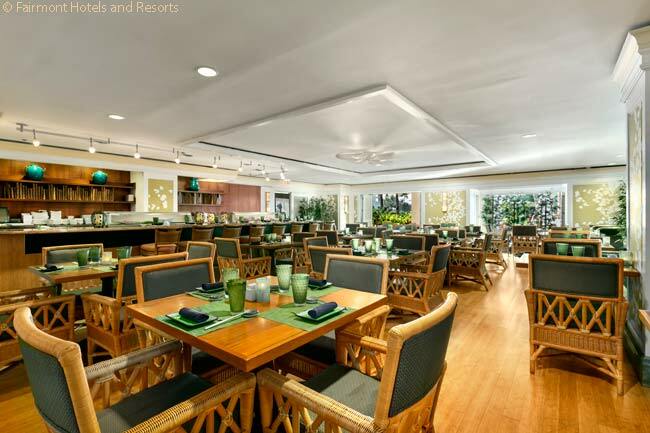 There’s good food in the Mauna Lani Resort, an expansive development that wraps around the Orchid, too. One standout is The Canoe House, an independent restaurant that features fresh and local fare. We took the Orchid’s free shuttle to The Canoe House for dinner one night, but on that occasion the shuttle service was stretched thin, necessitating a 45 minute wait for the short return drive – a rare slip-up. Shopaholics will want to make the 10-minute drive south to the Queen’s MarketPlace and King’s Shops for keepsakes, clothing and still more food. I recommend Lemongrass Express, a very good, Asian-inspired lunch counter in the Queen’s MarketPlace, run by a former Fairmont chef. The Orchid offers a nice mix of active and laid-back. You can paddle an outrigger canoe, maybe hike around black-lava petroglyphs (note: wear sturdy shoes). 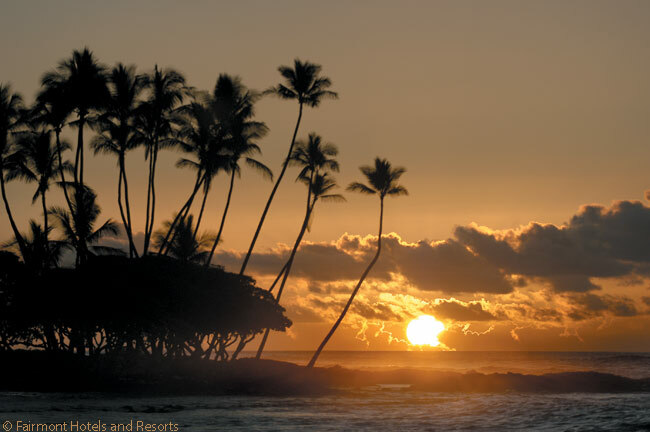 We liked to end our days in the Luana Lounge bar, listening to the nightly sounding of the conch and watch the glorious Hawaiian sunset as the tiki lamps were lit under the night sky and green sea turtles waddled up on land. 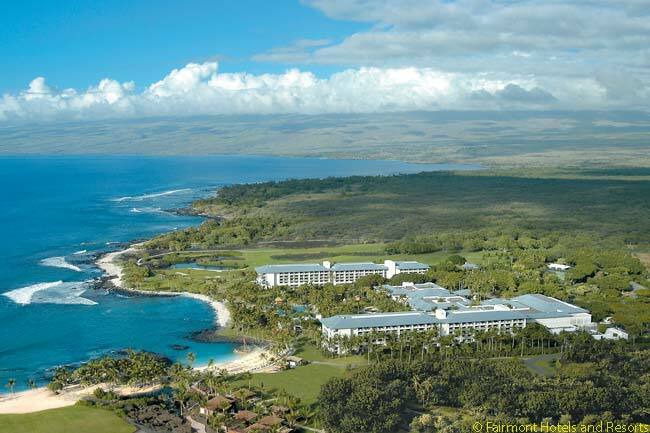 The Fairmont Orchid is located at One North Kaniku Drive, Kohala Coast, HI 96743, 30 miles north of Kona International Airport, off Highway 19. 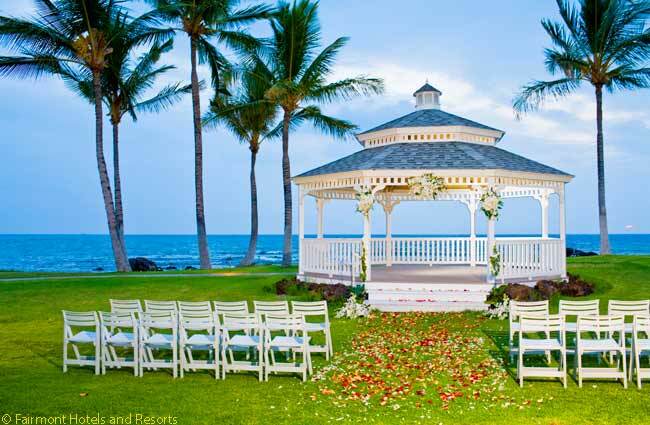 For more information or to book, telephone (800) 847-6295 or e-mail orchid(at)fairmont.com.